What is an On-Track Indicator? Target Dashboard has a number of gauges, both analogue and digital. You can already track whether or not your current metric has hit target, is above it, or below it. But what if you are mid-month and know you won&apos;t likely hit target until end of month? How would you know if you are ON TRACK to make target at month end? Enter the digital gauge with target and on-track display. This new digital gauge not only tells you if you&apos;ve made target and how far off you are to hitting target, but it also calculates how far into the period you are and whether you&apos;re on the path to success. It makes obvious your trajectory - whether you&apos;re likely to make target, or if you&apos;re off the tracks. Step 1: Pick a dashboard, edit mode, and click Add Other Item. Step 2: Choose Gauge from the list. 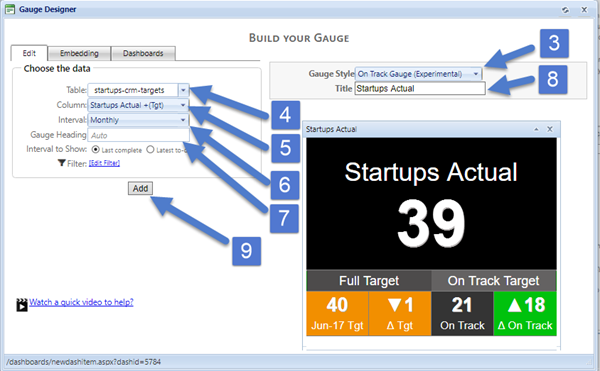 Step 3: Select On-Track Gauge (Experimental) from the list, then complete the other fields. Steps 4-8: Select your data table, which column, interval and set heading + title, then click Add. You could end up with something like our Orderwise sales data on-track gauge below.